Having slept well, we woke up at seven to a crisp cool morning. We put on our jackets and went out for a walk. It was very still and quiet, and we seemed to be the only ones about. We followed a small path behind the corral down to the river where the horses went to drink. We explored along the creek by the camp. The sound of bells heralded the arrival of the horses. The wranglers came out to meet them as they entered camp, giving each horse a few bites of oats as it entered the corral. We stood by the fence and watched, and the wranglers told us about the personalities of the different horses and mules. Paul checked each one over carefully, petting and rubbing their faces in his quiet way as he examined them for saddle sores or injuries. 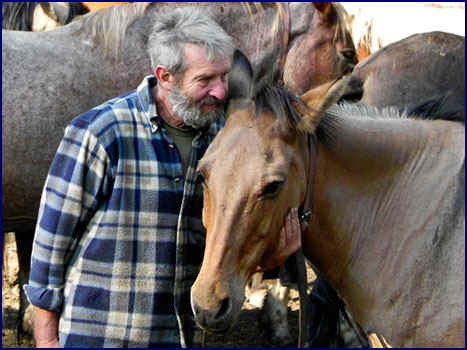 His love of these animals was evident in the way he handled them and whispered quiet secrets in their ears. Paul then built a 'smudge fire'; he started a small campfire in the middle of the corral, then shoveled a bit of manure over it, causing it to smolder and smoke. The horses would gather around it to keep the flies and mosquitoes off during the day. The wranglers told us that early in the season the horses usually come in to the corral on their own, eager for the handful of oats. But later in the season when the grass gets scarce close to camp, the wranglers have to go out on foot and find them in the mornings, sometimes miles away, tracking them by the sound of their bells. There were 16 horses and 7 mules at the camp. I had never been around mules much before, and was surprised by their interesting and affectionate personalities. The wranglers told us a lot about them; we learned that mules live for up to fifty years, and are very intelligent. They have steady personalities and do not panic as easily as a horse, but they can be very stubborn. They said that a mule never forgets, and will hold a grudge against someone if they are not treated right. They are hardy and strong, and can carry a bigger load than a horse. Their feet are very tough, and they generally do not need shoes. The mules will jump in and out of the corral at will; the wranglers told us about one who would jump a five foot fence while tied to it, without ever taking the slack out of his lead rope. Once the horses were all in the corral, it was time for breakfast. It was my first experience with cowboy coffee. It was boiled on the stove in a big iron pot, grounds and all; when it was ready they would add a dash of cold water to settle the grounds to the bottom, and serve it in tin cups. It was wonderful - I thought it might be the best coffee I had ever tasted. Lois served us an excellent breakfast of French toast and bacon, cooked on the camp stove. She poured the extra bacon grease on the campfire, causing the flames to shoot up with a whoosh. It took a while to get all the horses ready, so it was 11:20 by the time we got under way. There were nine of us riding out that day. Shelly and Louise, the other two guests, were mounted on a pair of big roan Quarter Horse/Percheron crosses. Pete led the group on an attractive buckskin that looked like Ben Cartwright's horse. Pat, a friend of Pete's, came along for the ride - he was there helping out on sort of a working vacation. Rob the blacksmith was a part of the group, along with a young wrangler named Dave, and Paul brought up the rear on a somewhat flighty appaloosa. The wranglers all carried rifles as well as an assortment of ropes, axes and handsaws. Paul also had a chainsaw strapped to his saddle. We set off through the poplar forest, and before long headed up the mountainside. I rode Magic again, but Jineen was given a huge black Percheron cross named Thunder. She found him lovely to ride, very responsive, though an old injury made him a bit sore when crossing the rocks. We noticed that the horses were trained to follow head to tail, and they resisted any attempts we made to ride side by side. They also jealously guarded their place in line, pinning their ears and swishing their tails in annoyance if another horse tried to pass. We followed a steep path up through the trees. After about an hour we came out on a high open hillside with beautiful views down over the Smoky River and the mountains beyond. Since Rob was new to the outfit, Paul was clueing him in on what to expect; he said that later in the season Rob would have to come up here on foot to find the horses in the mornings. Rob nodded and looked resigned. We continued up through woods and meadows, the trail becoming steeper and harder to follow as we wound our way around to the far side of the mountain. As we rode, Pete told us about the area. Willmore is unspoiled wilderness, and has changed little from how it was hundreds of years ago. The fact that there are no roads and no motorized vehicles allowed keeps the park natural; the only access is by foot or horseback. 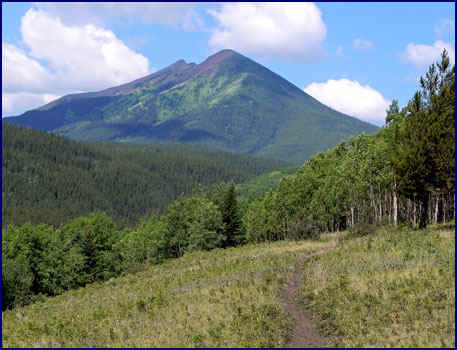 It is used by hikers and trail riders in the summer, and in the autumn it is a big hunting area. During winter trappers still maintain trap lines in Willmore. I don't care for hunting and I detest trapping, but I do respect that we don't all like the same things, and it is largely because of its appeal as a hunting area that the land has been preserved as wilderness. 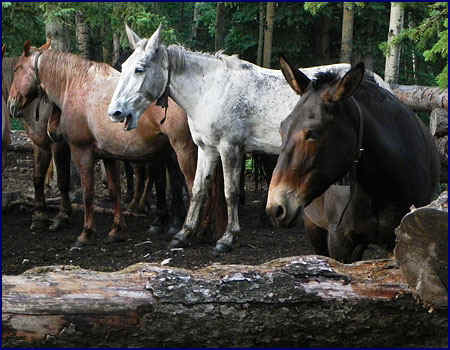 There were many trees down across the trail, and the horses would carefully step over them, one foot at a time, even when they were belly high. 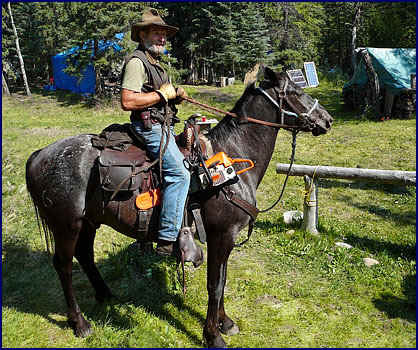 All of the horses are used to both ride and pack, and Paul told us they learn in a hurry not to jump when they are carrying a pack. He said if you are leading a string of six or seven loaded pack horses and one of them jumps, it is a real problem! Several times we came to fallen trees leaning across the trail above us; even when there was plenty of room to cross underneath them, Pete always led us carefully around - he said they were called widow makers, and that you should never go under them. At one point Shelly dropped her hat, and Paul gallantly retrieved it for her - without dismounting! He crooned, 'stay, stay' to his nervous mount, who unlike the chainsaw-broke Magic, was none too steady. Then much to the admiration of the group, while standing balanced on one foot, he took the other out of the stirrup, leaned way over to the off side, and reached down to the ground to grab the hat. The trail continued to climb, and presently we came out in an area where a forest fire started by lightning had gone through about 20 years ago. Huge portions of the mountainsides around us had been burned. We rode between tall bare pines, long dead but still standing, and the forest floor was thick with undergrowth and new trees. Fireweed was blooming everywhere; these tall purple flowers flourish after the older growth is burned off. Pete explained how fire is an important part of the natural order, and good for the ecosystem. It clears out old trees to allow areas of new growth, creating habitat and forage for the wildlife. Once again in an educational tone, Paul informed Rob that he would have to track the horses up there in the mornings later in the year. Rob looked dismayed. Pete told us about grizzly bears, and their habits and territory. As we went higher up, the trail was very overgrown; it was the first time it had been traveled that year. In several places there was deadfall across the trail that could not be negotiated; Paul would then dismount, pull out the chainsaw he carried on his saddle, and clear the trail. Magic was marvelous, but the trail was relentlessly steep, and I could feel her tiring on this rugged terrain. The horses had just begun work after having been turned out for months, so they were not very fit. Despite this, their stamina was remarkable as they struggled up the steep rocky slopes. The horses would drink at each stream crossing, but water became scarcer as we went higher. We came to a natural shelf on the mountainside, which Pete called 'the balcony.' 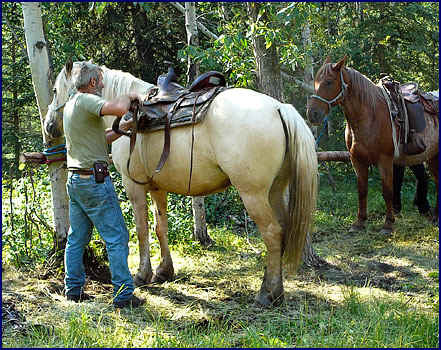 We stopped and tied the horses to trees, then walked around a bit, stretching our legs. Paul started a campfire to cook lunch; hot dogs were produced from the saddlebags, complete with buns, ketchup, mustard and relish. Pete and Rob 'glassed' the mountain slopes opposite us with a high powered hunting scope, looking for wildlife. Pete spotted three elk, several miles away. With a touch of sadistic glee, Paul told Rob he would have to hike up here to find the horses in the mornings during hunting season. Rob looked aghast. It seemed a really long way to go on foot in search of the herd; I wondered if Paul was yanking Rob's chain a little. After lunch we continued upward, and as we got nearer to the top of the mountain the trail became impossibly steep. I felt sorry for the horses as they scrambled up the severe incline. 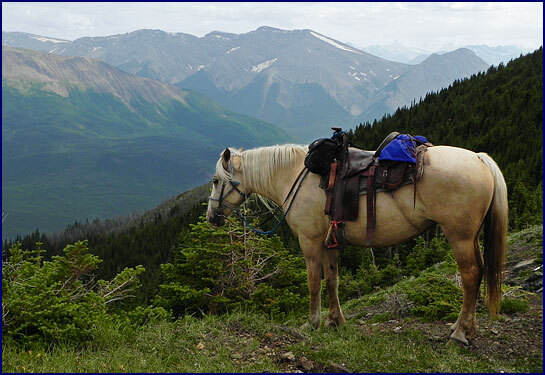 In the western saddles, you can't really get up off their backs on the steep bits like you would in an English saddle. The horses were hot, and very thirsty now - we had been unable to find a place to water them for some time. They struggled up the switchbacks, climbing ever higher. The trail gradually faded away as we came out above the treeline, and we made our way across the open tundra, looking for the path of least resistance. We were almost to the top. Paul looked at Rob, deadpan, and informed him that he would often have to search for the horses up here in the mornings - but finally even Rob realized that Paul was having him on. We made a last push up to the summit. We stood on a narrow saddle on top of Stern Mountain and gazed at the incredible vista before us. There were magnificent views 360 degrees around us. It was an amazing spot; we could see forever. Looking down over the Smoky River from the top of Stern Mountain. It couldn't have been a more perfect day. 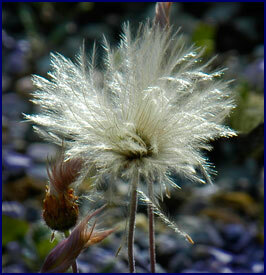 The sun was shining, the air was warm , and a fair breeze was blowing. 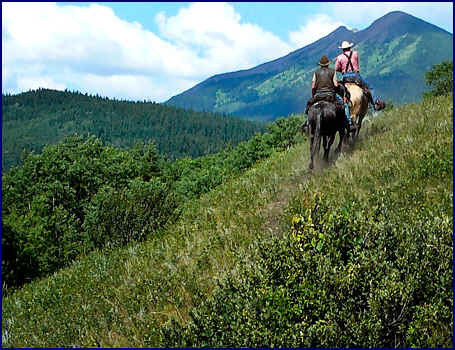 We left the horses standing, happy for a rest, and we walked along the ridge top. Pete's friend Pat had been up there before, and he showed us a little knoll further up the ridge where the views were even more spectacular. I didn't want to leave the mountaintop. I would like to have stayed there for hours, contemplating, soaking in the beauty, reveling in the wildness of it all. To just sit and look, and listen. The mountains have a language of their own - there are stories in the wind, but we don't often take the time to listen to them. We get so busy speeding through life, but today, at least for a little while, life had unfolded at the speed of a horse's walk. I savored each moment, and the time we spent on that mountaintop will remain engraved in my memory. The view down the back of Stern Mountain. All too soon it was time to leave. 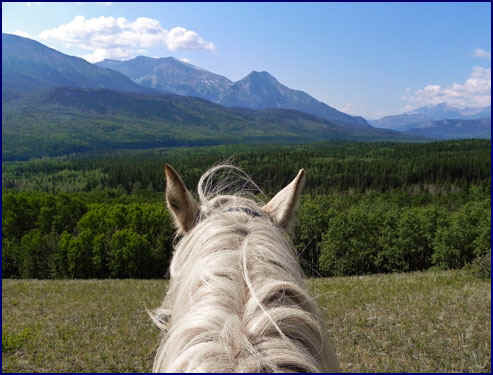 It was after five o'clock when we started down the mountain, with the horses now rested and eager to get home. We worked our way down the steep slope, picking our way through the tundra, looking for safe footing. Magic was impatient because she likes to be near the front (so do I), but we were taking our turn near the rear of the line. We took a slightly different route than going up, and if anything it was even steeper. We came across a tiny stream bubbling out of the hillside, and the horses drank and drank. Going down the mountain was much less exertion for the horses, but the way was steep and sometimes treacherous; I was thankful for Magic's surefootedness. I considered what my own horse, Drifter, would think of the lifestyle of these mountain horses; he is spoiled and pampered in comparison. But I decided that on the whole he would like it; he loves trail riding, and I think he would quickly adapt to looking after himself more. He wouldn't be too thrilled about being expected to work for six or eight hours in a day, but he would really like the part where he got to roam free in the wilderness at night. Though I'm not sure he would take too well to being a pack horse . . .
Magic waits patiently at the top of Stern Mountain. We arrived back in camp at seven o'clock, eight hours after setting out, tired but thoroughly happy. That ride to the mountaintop will remain in my memory, added to the collection of moments in life I shall always cherish and hope never to forget. After so many hours in the saddle our knees were aching. Upon dismounting I noticed that my legs seemed to be shaped a bit different; now I understand why cowboys are bowlegged. But already my muscles were becoming accustomed to the western saddle, and I felt less sore than the day before. And if we were tired, we could just imagine how our horses must have felt! That evening was a perfect time to make use of the excellent shower tent; when the wood stove is going the water runs continually at just the right temperature. Once clean, we all gathered around the campfire, talking about what a great day it had been, and how much we had enjoyed the fabulous ride. The only thing that could have made it any better would have been to see bears. Pete told us that tomorrow we would ride even higher. Lois served another excellent camp-cooked meal; ham, potatoes, salad, and amazing cinnamon rolls for dessert. 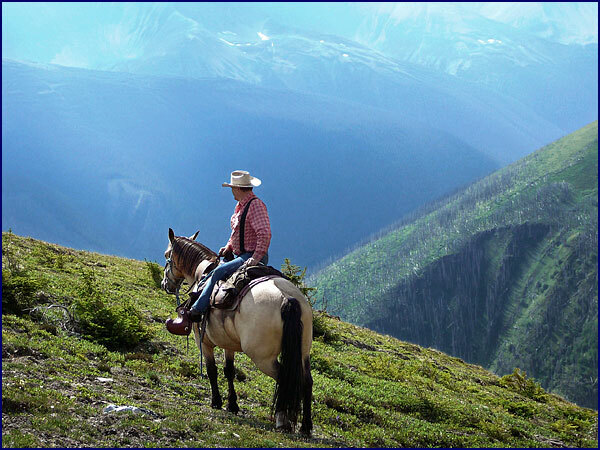 I raised my cup of wine and made a toast: To horses, to mountains, to wranglers and cooks.